Many historical accounts of the closing months of WW1 tend to 'gloss' over the combatant events of October and November 1918, some writers even referring to those two months as a 'mopping up exercise'. Such a view is not truly reflective of the many actions that took place, especially as the "Western Front" was never truly broken and that as the German Army was pushed backward, their front line remained intact. The ever advancing allies, pushing their foe back stretched their own supply lines to the limit; eventually bringing the allied advance to a temporary halt as September moved into October. Thus arrived a most important part of the advance by the allies toward Germany; the task of liberating the many towns and villages that had been subject to occupational rule for over four long years. Such villages were fiercely defended by German soldiers, but fall they must if the allied advance was to continue; any failure to capture a village could adversely impact the time to victory, but more importantly for the local inhabitants, prolong the misery of occupation. This period is known as the Battle of Courtrai and it took place between 14th - 19th October 1918. For the small village of Ledegem, occupied by the Germany army since 1914, the advance of the 29th Division of the 2nd Army would be a momentous period. On October 1st the inhabitants of the community thought that their day had come when the 12 Battalion Royal Scots had briefly entered Ledegem but their exhilaration turned to disappointment as the Germans fiercely defended their positions beating the Royal Scots back to the line of the railway. 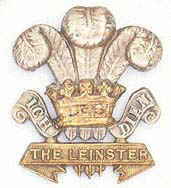 But as we now know the allies were determined to advance at all costs and as the "last big push" commenced in the early hours of the 14 October 1918, it was the 2Bn Leinster Regiment that fought its way into and through the village, pushing the German front line backward once more and setting the people of Ledegem free from occupation. Four hours after zero hour Ledegem was declared to have been taken, but the success had not been without cost. The morning of the 14th October 1918 was one with a heavy low lying fog. Whilst this gave some advantage to the advancing troops it also hid from view well disguised machine gun emplacements that were 'passed by' and then continued to fire upon the support troops as they followed the 2/Leinsters. Seventy seven men of the regiment were seriously wounded, some to die from wounds a few days later, and thirteen men died in the initial advance. The second line of the advance was undertaken by the 4th Battalion of the Worcestershire Regiment who advanced as the low laying fog started to lift exposing them to the previously hidden German machine gun emplacements. It fell upon the men of the 4/Worcesters to overcome these machine guns and they suffered heavy casualties as they moved forward to consolidate the liberation of the town. The occupying forces had aggressively defended their positions within the town and for both the Leinsters and the Worcesters this was not a "mopping up" engagement but a fierce fight for ground!